It is hard to believe a year has passed since the last John Moore Pike Trophy match at Grantchester Meadows. The winner of that match and defending champion, Robin Lipscomb had a hard task in defence with this year’s change of venue, the TA Lake. The lake in the past has proven to be moody in cold water conditions and Sunday was no exception. All Anglers drew a peg number from the hat for their initial swim, but as a roving match the rules allowed Anglers to fish any vacant swim if desired. The match started slowly without a bite to anyone. Two hours in and things were looking dire with thoughts of how would we choose the winner, would it come down to a casting competition to decide the champ?! 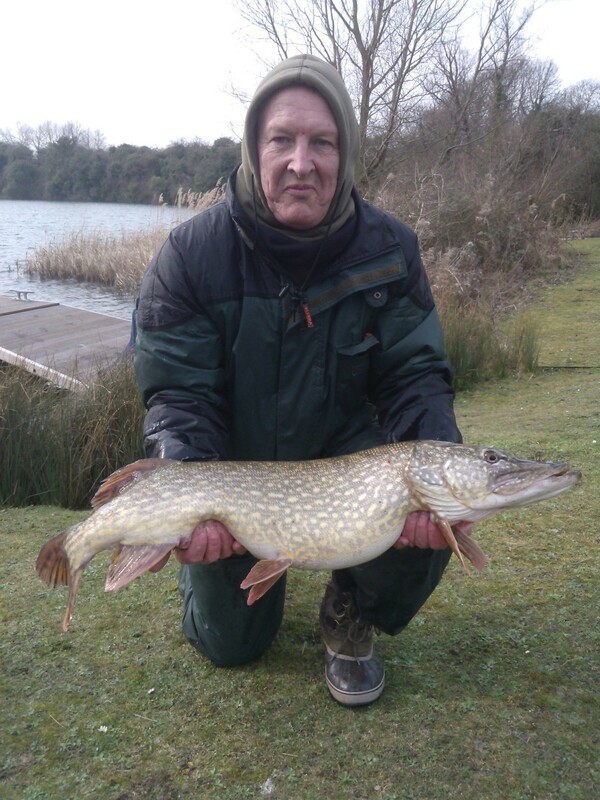 But as often in Pike fishing, a 30 minute feeding spree saved the day, firstly with Andy D having a four pounder from an interesting corner swim. I had a smallish Pike on briefly but it swam under a sunken tree and transferred the hooks to it, leaving me to commence battle with the log. The log won. The feeding spree ended with Steve W bagging a three pounder but keeping Andy in first position. 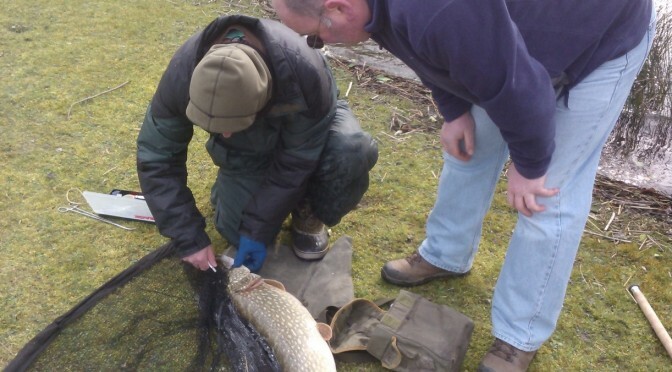 That changed rapidly when Robin struck into a heavy Pike which battled hard until safely netted by Mick. On the scales the wonderfully conditioned Pike went fifteen pounds Nine ounces and took the lead by a mile. As swiftly as it started, the feeding spell stopped with no more action for anyone for the last hour of the match despite a few Pike being spotted. So, Robin managed to do the double and defend his title and so is crowned 2014 Pike Trophy champion! Well done Robin! Sundays MSSC Anglings match was indeed a game of two half’s, a dry half with the fish biting and a wet half with the fish not biting! This was the last big match of 2013 for the members, this time we were invited onto Cambridge University home turf. We gratefully accepted the kind offer to join their Angling club members on their stretch of the upper River Cam near Grantchester. It was their annual charity match with all proceeds going to the Arthur Rank Hospice. We all gathered at the fishery alongside the University members with some decent sunshine but secretly praying the forecast rain would hold off. The river looked good with a nice tinge of colour after the recent rain and we were all fairly optimistic with our drawn pegs. The first hours fishing was slow but bites were forthcoming for most competitors and small fish caught. That was to change along with the weather, as the clouds rolled in the bites dried up and it became a gruelling last couple of hours with most Anglers scratching around for bites. The river, although looking good was probably chilled with the flush of cool water from the weeks rain and the fishes appetites were suppressed. The final whistle could not come fast enough, especially for me as the last two and a half hours went without a fish! The local knowledge prevailed in the end when the winner, Mark Leach, a University member, put together a nice net of Roach and Gudgeon for 3lb 14oz. Andy Doughty flew the MSSC Angling flag with his 3lb 8oz haul bringing him a well deserved second place. Third place was Uni member Colin Pegrum with me fluking fourth position with a few lobworm caught Perch and a small Jack Pike. All in all a good day despite some rain showers, with all Anglers catching albeit not huge net full’s. With the top four places being shared equally between University and Marshall members it would seem ‘even Stevens’. In reality we outnumbered them and so it highlights that they out performed us on the day (or had better peg draws!). Our exclusive access lake has produced some good double figure nets of silver fish with the occasional decent Perch to two pounds. Bream to five pounds ten ounces so far. The MSSC Angling Cup was fought for on Atkins water, one of Waterbeach Angling Clubs fine lakes. It was a good turn out with the lake nearly full for the 3 hour evening match. It was a ‘no Carp’ allowed match so it was all about the Bream and Roach! In the end the Bream were the deciding factor, with Robin Lipscombe landing a few for his winning catch of 14lb 2oz. The rest of the competitors were all within a few ounces of each other so a pretty close match after Robins haul. This is his second win in our two matches so far, can anyone knock him off his podium in the next? Our exclusive access lake has produced Roach, Perch, Rudd and small Bream so far. A few Carp have been sighted, stirring from their winter slumber, so we hope to see one visit the bank soon!